Governors from the Niger Delta region on Sunday after an emergency meeting launched a tirade at President Mohammadu Buhari and his All Progressives Congress (APC), saying that the government has no regard for the people of the Niger Delta region. They also raised the alarm over arms-build up in Niger Delta states by APC leaders in the region with the intent to cause mayhem and a general breakdown of law and order during the elections. 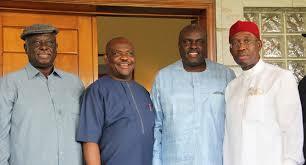 The meeting called at the instance of Governor Henry Seriake Dickson of Bayelsa State, was attended by Nyesom Wike , Ben Ayade and Emmanuel Udom of Rivers, Cross River and Akwa- Ibom respectively. The governors said the planned arraignment of the CJN was a pointer that Buhari has no regard for the Niger Delta region. The governors noted that the development at the Supreme Court â€œis capable of causing avoidable anxiety, tension and possible breakdown of law and order in the country,â€ adding that â€œthe action undermines confidence not only in the judiciary but also the electoral process that has already commenced, in view of the pivotal role that the judiciary plays in the process of electoral adjudicationâ€. They declared that â€œPresident Buhari should know that the continuous assault on critical institutions of state is a defining feature of a dictatorshipâ€ stressing that the â€œPresident is obliged to live up to his word that he is a born-again democrat, as he assured Nigerians in 2015â€. They therefore call on President Buhari to â€œcondemn without any equivocation, this assault on the CJN and the judiciary especially coming after similar assaults on the National Assembly, to save the country from this embarrassment and global contemptâ€. The Niger Delta governors also call on the CJN to ignore this so-called court summon from the CCB and the provocative call for his resignation in some quarters.